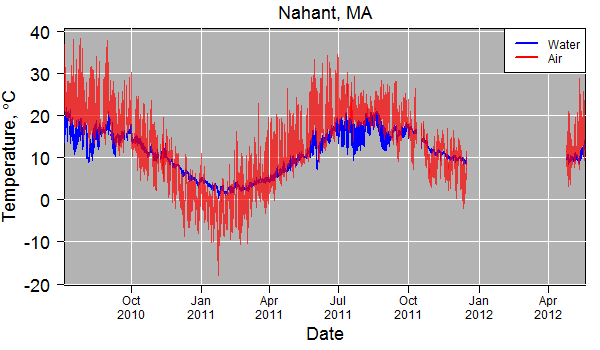 These data were collected from July 2010 until May 2012. Water temperatures were recorded inside the Marine Science Center’s seawater system. I have verified that these temperatures are very close (within 1 °C) to the ambient water temperature in the ocean near the seawater system intake (system intake location shown below). The MSC’s original seawater system (still operating in 2012) had minimal residence time due to heavy use and a tiny storage capacity, so there wasn’t much time for water to heat up or cool down in the holding tanks and pipes on land. In the temperature record during summer you can often see the temperature signal of the shallow surface thermocline moving up and down past the seawater intake in sync with the tide, since the intake was situated barely below the zero tide level. Missing data were occasionally due to periods when the seawater system broke down or clogged, so all water temperature data were discarded during these times. Air temperatures were recorded in the shade outside the MSC building, though not in a proper weather station shaded housing. Temperature data were measured with TMP-36 semiconductor temperature sensors, calibrated in a water bath against a 0.1C thermometer at the start of the summer experimental seasons in 2010 and 2011.